Uncommon publication by Johns Hopkins University. Topographical Map of Baltimore and Vicinity. A rare and unusual discovery. Ostensibly this is a fine example of 1892 U. S. Geological Survey map of Baltimore, Maryland, and vicinity. However, the United States Geological Survey never issued such a map. Instead this an uncommon publication issued by Johns Hopkins University based on earlier U.S.G.S. Survey work. 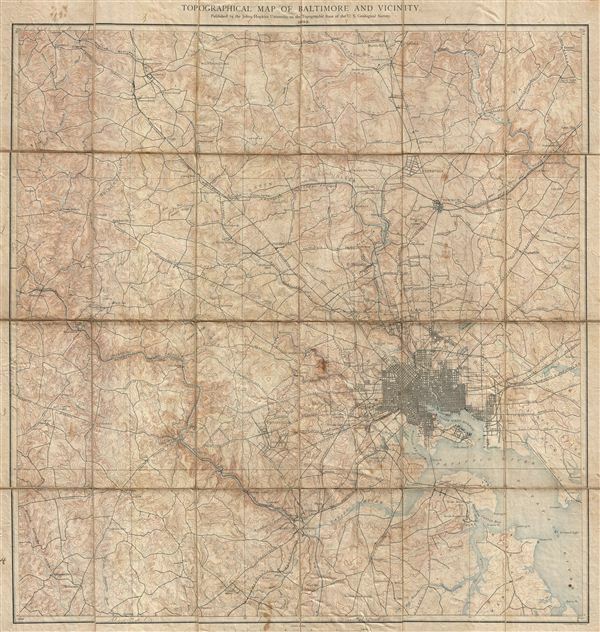 The folding map, which is dissected and backed on linen, covers the city of Baltimore and its immediate vicinity from Marble Hill to Furnace Creek. It offers extraordinary detail to the level of streets and often individual buildings, noting St. Charles College, Sheppard Asylum, etc. Villages and towns around Baltimore, including Oxford, Waverly, Friendship, Hampden, among others, are also noted. The city boundary is clearly marked as are various roadways, railroads, mills, rivers, creeks, lakes and various other topographical features. . The map was published by the Johns Hopkins University, based on U.S.G.S. surveys, in 1892. Published by the Johns Hopkins University on the topographic base of the U. S. Geological Survey. George H. Wiliams, Editor. Geology of the Sedimentary Formations by N.H. Darton, geology of the Crystalline Rocks by G. H. Williams. Good. Dissected and mounted on linen. Even overall toning. Verso linen fragile.